Wildfires in California have killed at least 40 people and burned more than 217,000 acres in the past few weeks. Nearly 8,000 firefighters are trying to contain the blazes with the aid of more than 800 firetrucks, 70 helicopters and 30 planes. In remote areas difficult to access by firetruck, smokejumpers may be needed to parachute in to fight the fires. But danger looms before a smokejumper even confronts a fire. When they’re not battling wildfires, many smokejumpers pursue advanced studies in fields like fire management, ecology, forestry, and engineering in the off-season. At Washington Institute, smokejumpers and other students in the Technical Fire Management (TFM) program apply quantitative methods — often using Minitab Statistical Software — to evaluate alternative solutions to fire management problems. “The students in this program are mid-career wildland firefighters who want to become fire managers, i.e., transition from a technical career path to a professional path in the federal government,” said Dr. Robert Loveless, a statistics instructor for TFM. As part of the program, the students must complete a project in wildland fire management. One primary analysis tool for these projects is statistics. “Many students have no, or a limited, background in any college-level coursework,” Loveless noted. "So, teaching stats can be a real challenge." Minitab often helps students overcome that challenge. “Most students find using Minitab to be easy and intuitive,” Dr. Loveless said. That helps them focus on their research objectives without getting lost in tedious calculations or a complex software interface. For his TFM project, Steve Stroud used Minitab to evaluate the relationship between the age, the number of jumps used, and the permeability of a smokejumper’s parachute. 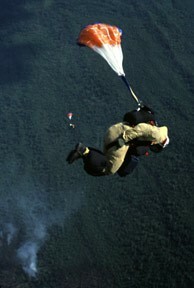 The permeability of a parachute is a key measure of its performance. Repeated use and handling cause the nylon fabric to degrade, increasing its permeability. If permeability becomes too high, the chute opens more slowly, the speed of descent increases, and the chute becomes less responsive to steering maneuvers. Not things you want to happen when you’re skydiving over the hot zone of raging wildfire. Stroud sampled 70 smokejumper parachutes and recorded their age, number of jumps, and the permeability of cells within each parachute. Permeability is measured as the airflow through the fabric in cubic feet of air per one square foot per minute (CFM). For a new parachute, industry standards dictate that the CFM should be less than 3.0 CFM. The chute can be safely used until its average permeability exceeds 12.0 CFM, at which time it’s considered unsafe and should be removed from service. Smokejumpers could be 99% confident that the mean permeability in unused parachutes (0-10 years old, with no jumps) was between 1.99 and 2.31 CFM, well within industry standards. Only one unused parachute, an outlier, had a cell with a CFM greater than 3.0 (3.11). Although never used in jumps, this parachute was 10 years old and had been packed and repacked repeatedly. For used parachutes (0-10 years old, with between 1-140 jumps), smokejumpers could be 99% confident that the mean permeability of the parachutes was between 4.23 and 4.61 CFM. The maximum value in the sample, 9.88, was also well below the upper limit of 12.0 CFM. The service life for the smokejumper parachutes was 10 years at that time. However, this duration was based on a purchase schedule used by the U.S. military for a different type of parachute with different usage. 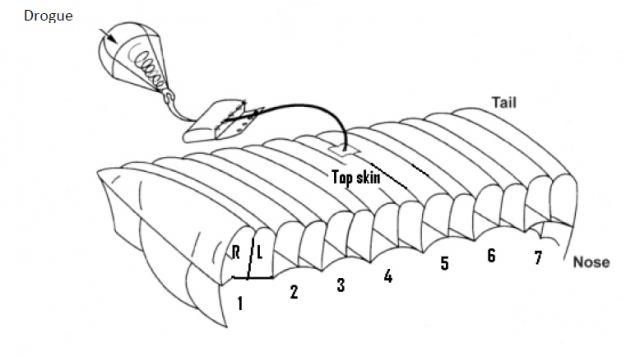 Smokejumpers use a special rectangular parachute made of pressurized fabric airfoil. Both predictors, the number of jumps (log) and age of the parachute (log), were statistically significant (P = 0.000). The coefficient for LogJumps (0.19708) was greater than logAge (0.17021), indicating that number of jumps is a stronger predictor of the permeability of a parachute than its age. The R-Sq value indicates the model explains approximately 75% of the variation in parachute permeability. Using the fitted model, the permeability of the chutes can be predicted for a given number of jumps and age. Based on 99% prediction intervals for new observations, the study concluded that the service life of chutes could be extended safely to 20 years and/or 300 jumps before the permeability of any single parachute cell reached an upper prediction limit of 12 CFM. By adopting this extended service life, Stroud estimated they could save over $700,000 in budget costs over a period of 20 years, while still ensuring the safety of the chutes. Stroud’s TFM student research project, completed in 2010, provided the impetus for further investigation and potential policy change in two federal agencies.